Chinese university students often suffer from acute stress, which can affect their mental health. We measured and evaluated perceived stress in this population using the Simplified Chinese version of the 10-item Perceived Stress Scale (SCPSS-10). The SCPSS-10, Patient Health Questionnaire (PHQ), and Generalized Anxiety Disorder 7-item scale (GAD-7) were conducted in 1096 university students. Two weeks later, 129 participants were re-tested using the SCPSS-10. Exploratory factor analysis yielded two factors with Eigen values of 4.76 and 1.48, accounting for 62.41% of the variance. Confirmatory factor analysis demonstrated good fit of this two-factor model. The internal consistency reliability, as measured by Cronbach’s α, was 0.85. The test-retest reliability coefficient was 0.7. The SCPSS-10 exhibited high correlation with the PHQ-9 and GAD-7, indicating an acceptable concurrent validity. 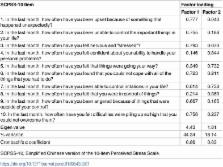 The SCPSS-10 exhibited satisfactory psychometric properties in Chinese university students. This study was supported by the Ministry of Science and Technology Project (2009BAI77B08), Shanghai One Hundred Talent Project in health division (XBR2011015), and the National Natural Science Foundation of China (81371486). Practice of breast self-examination and knowledge of breast cancer among female university students in Korea. Development of the Chinese version of the Oro-facial Esthetic Scale. Characteristics of 'best' and 'worst' clinical teachers as perceived by university nursing faculty and students.